While The Great Recession has left millions of Americans unemployed and wiped out countless retirement accounts, it hasn't inspired educators to get serious about teaching financial literacy. 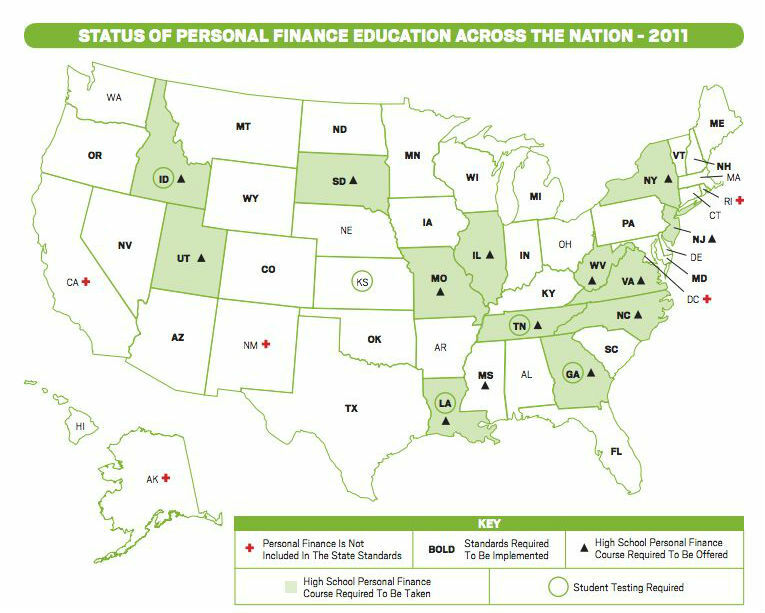 Today, less than half of states require high school students to take an economics class and fewer states require high schools to offer financial literacy classes than in 2009, according to a new report from the Council on Economic Education. Since 2009 only one state has introduced new requirements that high school students study economics in order to graduate, while three states actually stopped testing students' knowledge of the field, according to the report. Financial literacy courses haven't fared much better. As of 2009, 15 states required high schools to at least offer such classes. Today that number has dropped to 14. By downplaying the importance of financial literacy, states are missing out on the chance to better equip high schoolers to succeed as adults, according to a 2010 study from the National Endowment for Financial Education. After surveying nearly 16,000 college students, researchers concluded that students from states that required a financial education class were "more likely to display positive financial behaviors." Specifically, when compared to their peers, these students were more likely to save money, less likely to max out their credit cards, less likely to make late credit card payments and less likely to be compulsive buyers. High school is an especially good time to teach financial literacy because it is the last opportunity to instill the knowledge before students go onto college and, in all likelihood, take on piles of debt in the form of student loans. Two-thirds of college seniors graduated with loans in 2010, and those loans averaged more than $25,000. Yet two-thirds of college students don't understand the terms of their loans, according to a recent study from Young Invincibles, a nonprofit that represents 18 to 34 year-olds. Mounting student debt, combined with a tough job market and a slow economy, makes financial literacy that much more important, wrote Annamaria Lusard, an economics professor at George Washington University School of Business, in the Council on Economic Education report. "The financial crisis has put economic news on the front pages of newspapers daily, requiring individuals not just to be abreast of concepts such as deficit, national debt, and interest rate spread but also to evaluate the economic reforms that political leaders are proposing," she explained. "Just as it was not possible to live in an industrialized society without print literacy—the ability to read and write—so it is not possible to live in today’s world without being financially literate. To fully participate in society today, financial literacy is critical."